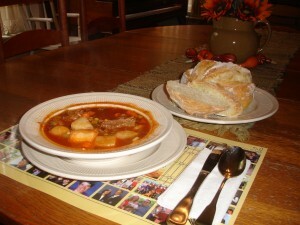 artisan bread + homemade soups = yum!!! A few weeks ago I wrote about my discovery of artisan bread baking and thought it would be fun to share an update. Since I began baking these delicious breads, I have only purchased 6 loaves of bread from the store so I guess you could say this has become a habit, a good habit! I have also been sharing this idea with friends and I know two who have also switched over to artisan bread now almost full time! Can I just say that our families are thrilled!?! Since as of yesterday it is now fall and I finally have a new charger for my camera, I thought I might share my son’s picture of last night’s soup and bread along with the soup recipe. (Our church handed out the neat placemats on Sunday so we could remember to pray for our missionaries every day.) This is our standby veggie soup recipe and it will even be better today. Over the weekend I tried a new recipe for wild rice soup and it was also a big hit so I am including it, too. I added salad and we could close our eyes and pretend we were at Panera, except the family pronounced our soup and bread even better!!! My mom used to make homemade vegetable beef soup at least once a week during the brisk Illinois winters and it was one of my dad’s favorite meals. This is my own version of her recipe and I like to put it in the crock pot while we are at Grady’s Christmas Tree Farm. How wonderful it is to smell this simmering soup when we walk in the door, shivering cold and in the spirit of the season! My recipe makes a lot of soup and it can be frozen for another day. Place the roast in large pot and cover with 16 cups of water. Salt and pepper well. Cook several hours until meat falls from bone. Add all the rest of ingredients and simmer until vegetables are cooked. Simmer on low for several hours or place in crock pot on low setting. In large pot, simmer veggies in broth until tender. Add seasoning (taste and add bouillon or soup starter if it needs more flavor). In sauce pan, melted butter over low heat and stir in flour; add milk to thicken. Add to broth along with rice. Continue simmering, adding evaporated milk for a creamier texture and thicken with a little more flour mixed with water if you prefer a thicker soup. Oh yum! I’m so glad I headed off to make dinner, because you made me super hungry! Since you put me onto Artisan Breadmaking, I’ve gone back over all my bread recipes and have totally redone how I’m doing things. It’s tempting to not have pizza every single night. My hips eternally thank you. Trish, can you share how you have “tweaked” your own bread recipes? I would welcome any and all tips. I am going to demonstrate how to make artisan breads for both my Toastmasters Club and for the kids in my speech class as an example of doing a demonstration speech. I will come prepared with already baked loaves to sample. Wouldn’t it be great if all those kids went home wanting to bake for their moms? The five minute artisan recipes all have approximately three cups of liquid and 6 and 1/2 cups flour per base batch. Another cookbook, I’ve been looking at uses a little more liquid, and from experience, I know that a kneaded dough with higher moisture content than usual, turns out just fine, so I imagine there is leeway with the amount of total liquid. I noticed that the amounts of yeast were a little more, but have found by experience that less yeast actually produces a nicer tasting loaf of bread, so have left the amount to one tablespoon. I also decreased the amount of salt to one level Tbsp. – found their recipes too salty and too, salt inhibits yeast. And I’ve upped the sugar to 1/2 cup, which is what my recipes had. The day I was going to try their pizza, I couldn’t find the artisan recipe book (hubby took it to work) so I just went ahead and used my own recipe as always, making sure that the oil was part of the total liquid. Lately, I’ve been including beaten eggs as part of the liquid and have skipped putting in oil. Today I increased their base recipe by a quarter because their base recipe produced just under the total amount of weight I wanted to work from. Once the dough is risen, I coat it in my container with flour and use a spatula around the edges to push flour down along the sides, then I flip the container upside down and the whole thing slides out. Then I fold the dough like a log over onto itself and gently seal all around with the flour, keeping the sticky part sealed into the center. I divide into 3 balls, each is enough for one loaf or a pan of buns. Or one ball divided is enough for a 13 inch pizza. I use my same old pans coated with lard and sprinkled with cornmeal. No pizza peel needed. I’ve also stayed with my bake times and temps for the white breads – 400 F – 15 min for rolls, 20 min for loaves, 12 min for pizza divided between top and bottom rack. The rye I baked at the higher temp and time like they did. It needed it. I like to use up leftover cooked cereal in my breadmaking and am going to be doing that this week. I think it will work just fine, so long as maybe no more than 2 cups of it go in a base recipe and I adjust the liquid in the recipe downward. The really only big difference I have seen between this method and what I’ve always done is the crust. We now get crusty crust with no effort. I haven’t been attempting to create a hard crust by creating the steam in the oven and still the crust is chewy. Oh, I forgot to mention that their base recipe was nearly the same as my basic white bread recipe and so it didn’t seem too scary to just use my own only using the no-knead method. Bread is quite forgiving. Cakes are scary. Trish, what great tips! I am printing them out and taping inside my artisan cookbook! Thank you for taking the time to share. And I agree…pizza every day wouldn’t be a bad idea and cakes ARE scary!